The DC Travel happy hours are starting to gain traction in the best way possible. A mix of regulars and newbies show up at each one, and whether the people have been around the world, or just around a city block, makes no difference. 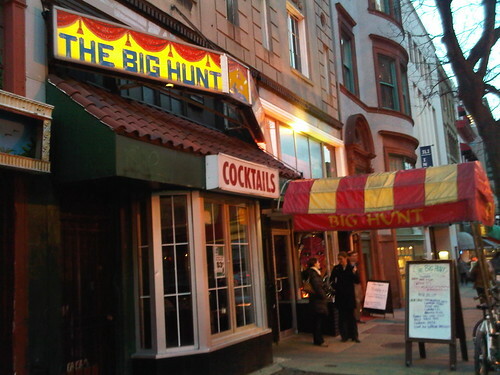 March's venue, as chosen by Stephanie of Twenty-Something Travel was The Big Hunt, a perennial favorite in Dupont Circle. I arrived early, and met up with Carolyn, who I was initially e-introduced to by Sherry Ott. Carolyn started a non-profit called Dog Meets World, which aims to bring people together through photography. The idea is for travelers to carry a little stuffed dog, and a portable photo printer, wherever they go. Then, when they inevitably want to take a local's photograph, they can share the dog, take the photo, and print a copy for them on the spot. I liked the idea the moment I heard about it, and am planning to try it for myself in Rwanda later this month. Steven (@travelojos) was the next to arrive. He's currently planning a trip to Guatemala. Diana from The Adventures of D rolled up soon after. She recently quit her PR job to travel through Europe and northern Africa….starting today! Chelsey (@chelseydc), a fairly recent transplant from Iowa, joined us, as did my friend Todd. And then I lost track of the order, as usual. I swear it wasn't the hearty porter I was drinking. Molly (@travelwithcurls), one of our regulars, congratulated me on the launch of Travel Blog Success last month, and confirmed her intent to sign up soon. Sonia (@pulpologist) and her husband Mark arrived as well, though Marilyn from National Geographic couldn't make it (so the saga of their inability to meet in person goes on). Lauren had previously contacted me through Medellin Living as she was interested in moving to Colombia to teach English in the city of the eternal Spring. On a random note, our waiter was cool, gave Diana a free beer at the end of the night, and mentioned he'd done a Peace Corps stint in Malawi. There were a few people I didn't get the chance to meet, and a few whose company were missed altogether. Thankfully, warmer weather and longer days are just around the corner, as is April's DC Travel Happy Hour! Special thanks to Melanie at Sisarina for the Twitter name tags, and Kelsey for photographing the event. All of the photos in this post are hers, except the exterior shot of the bar, which I took. To see all of the photos from the happy hour, check out Kelsey's recap at Drifting Focus. You left out your long lost best friend from high school! Makes me wish there were enough travel bloggers in Charleston, SC to have one of these! We do have couch surfers meetups though. Caroline – couchsurfing meetups are practically the same thing, though usually focused more around travel talk then blogging. Oh geez, you're right, but only because I forgot how to spell his name properly. Been a long time!